I don’t always write new blog posts when something cool happens, so maybe I should periodically summarize the most relevant unblogged things from a longer period of time into a single post. This is a brief summary of the most exciting film related things that have happened to me in March 2015. The blog now has a new domain name and I even managed to write a new about page! Even though I didn’t yet advertise it anywhere, I made a new high score system for the Magadheera-inspired Warrior Game that I made last year. (My record is now 353.) I hope to add support for touchscreen devices some day but right now I have no idea how to do that. Until that, it’s playable only with mouse or touchpad. I started the Super Star Project which might have been my worst decision ever. My DVD shelf is already so full! I’m glad I’m not doing a Brahmanandam Project. Now I’ve finally seen Student No.1 (Telugu, 2001) which completed my list of movies directed by S. S. Rajamouli, and Gangotri (Telugu, 2003) which was my last unseen movie of Allu Arjun as the hero. I’m quite a newbie to Hindi cinema since I’ve watched mostly South Indian films. While I’ve seen some random Hindi films before, I haven’t seen anything that good that would make me watch more Hindi films instead of Telugu or Tamil films. Still Hindi films are more popular than South Indian films, so maybe I’ve just watched the wrong movies? Now I started to explore Hindi cinema a little more systematically than before. I began by watching Sholay (1975) which was actually quite good. I was surprised how well the songs fitted in the story, as most Indian films that I’ve seen have at least a couple of songs that feel a little random and disconnected from everything else. I also got DVDs of some newer “super hits”, for example Dhoom and Krrish series, as well as some more or less questionable Hindi movies. 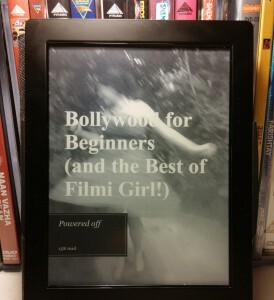 Just when I started to wander around in the big and scary world of Hindi cinema, one of the greatest Indian cinema bloggers, Filmi Girl, published a book called Bollywood for Beginners. I’ve really enjoyed reading it so far. I remember a day last summer when I traveled around my home town. I laughed silently in my head because I saw a man that I thought looked a little like Dhanush. Then I came home and read the unthinkable news that Dhanush was making his new film Shamitabh in Finland! I missed a screening of the movie in February but this year the Season Film Festival screened two Hindi films, Shamitabh and Raja Natwarlal, so I got another chance to see it. Both of the movies were worth watching even though I probably missed a lot of references to other Hindi films in Shamitabh. It’s funny that the first Bollywood song shot in Finland is a song about toilets. I also made a fool of myself by some very bad dancing when a Bollywood dance group made the audience to try some dance moves in the cinema hall before the show, but I forgot it as soon as an enormous image of Rajinikanth appeared on the screen in Eros International’s short video clip and said “Let’s begin!” which already was more than enough value for the ticket price. At least three interesting soundtrack albums for upcoming movies were released recently: M. Ghibran’s Uttama Villain (Kamal Haasan), Devi Sri Prasad’s S/O Satyamurthy (Allu Arjun, UPENDRA), and Ilaiyaraaja’s Rudhramadevi (Anushka, Rana, Allu Arjun). I managed to watch the live stream only from Rudhramadevi’s audio launch event. It was held in two different cities on consecutive days so that they released three songs a day. Anushka made a grand entrance in a royal carriage and some of the dance performances were entertaining (while some others were embarrassing). I also have to mention that I got the DVD of Aa Okkadu (Telugu, 2009) which has AJAY in hero role! I hope to watch it as soon as it fits into the schedule of one of my friends who also is an Ajay fan. And finally, I now have Yoddha (2014), the Bengali remake of Magadheera, on (unsubtitled) VCD, so now I’ll be able to make a screencap comparison between the two if I won’t have anything better to do. ‹ Baahubali shirts and hoodies!